Did you know that travelling one mile through a residential area at 20mph instead of 30mph will only add 1 minute to your journey time? Why not just take a minute and save a child’s life. This week is Child Safety Week, (23 to 29 June 2014). This is an annual campaign by the Child Accident Prevention Trust (CAPT) which aims to raise awareness of the risks of child accidents and how they can be prevented. Studies have shown that between the ages of one and two years, children’s mobility increases at a rapid but irregular rate, which means there is a chance that they can escape the supervision of their parents for a short time and get into a dangerous situation. It is not until children are between the ages of four or five that they start to understand the concept of danger, and begin to heed warnings given to them. However, until they are at least nine or ten, children have difficulty judging the speed of travelling vehicles, and how long they have to cross a road safely. Even older children are at risk. The number of children injured as pedestrians peaks at the age of twelve when many children start travelling to and from school on their own. While adult pedestrians can make accurate judgements when crossing a road, children cannot judge the speed of vehicles in the same way. Research on vision has found that primary age children cannot accurately see or judge the speed of vehicles travelling above 20mph caused by age-related inability to correctly register faster traffic. 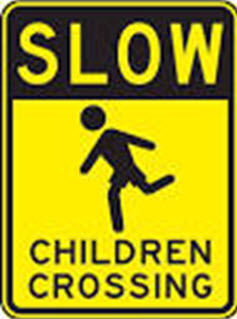 This means that even when children are paying very close attention they may make risky crossing judgements and are more likely to step in front of a fast approaching vehicle. Researchers measured the perceptual acuity of over 100 children in primary schools and calculated the approach speed that they could reliably detect. The results revealed that where adult pedestrians can make accurate judgements for vehicles travelling up to 50mph, primary school age children become unreliable once the approach speed goes above 20mph. Speed limits are designed to protect everyone – drivers, passengers, cyclists and pedestrians. They are intended to help drivers understand the dangers of each road, and inform them of the legal maximum speed. However, it isn’t always safe to drive the maximum speed limit, and drivers must be aware that sometimes they ought to drive slower. Speed limits are typically set for ideal conditions. Therefore, drivers must recognise and appropriately respond to a variety of factors and have a regard for existing and potential dangers. It is crucial that drivers adjust their speed according to the existing vehicle and pedestrian traffic, road surface, lighting, and weather conditions. The faster a vehicle is travelling, the less time a driver has to identify a pedestrian crossing the road, and has less time to react to what is happening around them. More distance is needed for vehicles to be able to stop safely from higher speeds. If there is a crash, the harder the impact will be, and the greater the chance of causing serious bodily injury or even death to a child crossing the road. Therefore, it is important that drivers always ensure that they drive within the speed limit at all times. However, drivers can sometimes find themselves above the speed limit, whether or not it is their intention to keep within it. This can be caused by many factors, such as the speed of other traffic, or not paying close attention. But the fact of the matter is, whether by intent or accident, driving over the speed limit is illegal and can be very dangerous. To help drivers keep within the speed limit, The Royal Society for the Prevention of Accidents (RoSPA)has produced a helpful guidance: Top Ten Tips to Avoid Speeding. We all know that the Highway Code is essential reading for all road users, and sets out rules and guidelines designed to promote road safety. As many of the rules in the Code are legal requirements, it can therefore be a criminal offence if the rules are disobeyed. Rule 125 clearly states that “the speed limit is the absolute maximum and does not mean it is safe to drive at that speed irrespective of conditions. Driving at speeds too fast for the road and traffic conditions is dangerous”. Rule 207 defines children as a category of vulnerable pedestrians who may not be able to judge a driver’s speed and could step into the road in front of the vehicle. 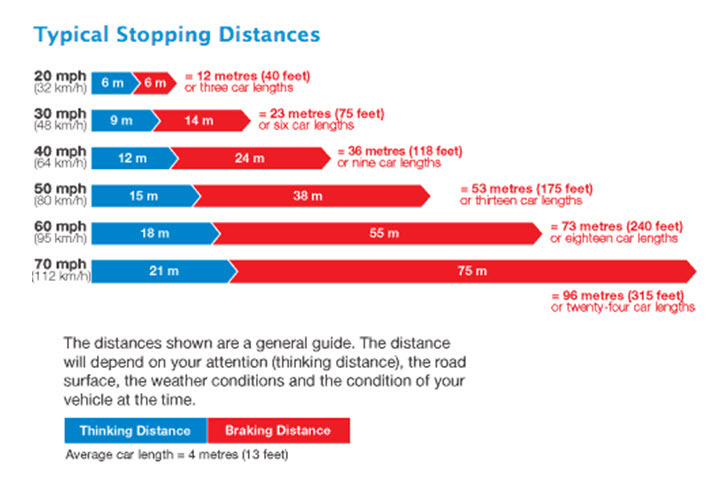 The diagram below from the Highway Code illustrates typical safe stopping distances for drivers. Speeding causes thousands of serious road accidents and injuries every year. 14% of accidents involving injury. Approximately two-thirds of accidents in which people are killed or seriously injured happen on roads with a speed limit of 30mph or less. The risk of a pedestrian who is hit by a vehicle being killed gradually increases until impact speeds of around 30mph. Above this speed, the risk significantly increases, so that a pedestrian who is hit by a vehicle travelling at between 30mph and 40mph is between 3.5 and 5.5 times more likely to be killed than if hit by a vehicle travelling at below 30mph. Brake, the road safety charity, is passionate about raising awareness to stop road deaths and injuries to make the areas we live in safer, greener, and improve the support for individuals involved in accidents. Brake campaigns nationally and regionally, and is one of many charities involved in making our streets safer for walking and cycling. One of the charity’s flagship campaigns is GO 20. The aim of the campaign is to make our roads safer for children and adults to walk and cycle, by encouraging drivers to reduce their traffic speed to 20mph or below, particularly around residential areas, schools and shops. Driving at 20mph can be life-saving. The campaign highlights the fact that if a vehicle is travelling at 20mph and a child runs out into the road three car lengths ahead, a driver ought to be able to stop in good time. However by driving at 30mph, a driver would be unlikely to stop in time and as a result hit the child and be at high risk of causing serious injury or even death. The campaign calls on drivers to GO 20 and to make driving 20mph the speed limit in our communities, making it a safer place for pedestrians, and, in particular, vulnerable people such as children. 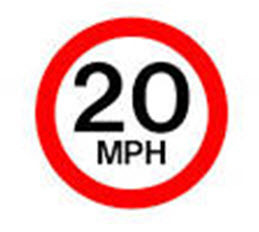 Some local authorities are supporting the 20mph speed limit, however it has yet to be made government policy. For more information on the GO 20 campaign and many others visit Brake. Encouraging children to walk and cycle to school not only helps children with their physical and mental health, but it also reduces congestion and pollution around the school gates. However, sadly, the biggest concern of parents when it comes to children walking and cycling to school is traffic danger. By promoting safer roads and reduced speed limits, our communities can benefit from children enjoying not only a healthier childhood but a healthier future too. Drivers committing to slowing down to 20mph is a very simply thing to do, but it can make a huge difference and even save lives. I’m delighted to hear that the government has recently commissioned research into the effects of cutting urban 30mph speed limits to 20mph. The research is said to cover the effects on speed, accidents, casualties, and the percentage of travellers using a particular type of transportation. As a solicitor specialising in serious injury claims, I see first hand from my clients the serious life changing injuries caused to children in road traffic accidents as a result of speeding. It is devastating to see the overwhelming long term effects that serious injuries can have for a child, especially in a situation which could have easily been avoided. Time and time again, I see expert reports from Accident Reconstruction experts in my clients’ cases which demonstrate that the accidents would have been avoided had those drivers been travelling at slower, more appropriate speeds, which would have preventing my clients from suffering serious injuries or even death. We all need to take responsibility and play our part in making sure our communities are a safer place for our children to live in. Charities such as CAPT need our support to ensure that the awareness raised during Child Safety Week continues all year round.